You remember how stressed Jacey and I were when our human moved us to a new place? We are still exploring and we are still finding new things to entertain us. Yes, I am a diabetic cat, but the key word in there is cat. You humans have a saying about curiosity and it killing the cat. I am still alive, so my natural curiosity hasn’t killed me but it does make for entertaining moments for my human. One of the things that I found interesting in our new home was this thing. Now, my human goes into it when he gets ready to leave for the day and he goes in there when he comes home. You humans do not have fur like me and Jacey do, so you have to put on these things called clothes. And I see those things in this place, which I understand you call a closet. 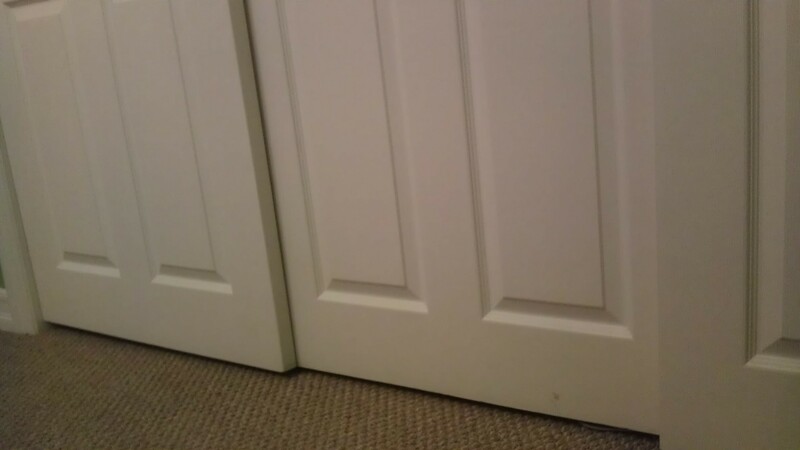 There are three doors that slide back and forth, and there’s no rail on the bottom like there was in our former home. That was just too much for this diabetic cat to pass up. I started to sniff at the bottom of the door, and then I decided to see what I could do with my paw. When the bottoms of the doors moved, I decided I’d push a little harder to see what happened. Well, eventually, I discovered that if I pushed hard enough, there would be enough room for me to go inside and see what things my human had in this closet. And I did. This was fun, but then I wanted to come out. And while I could open up enough space to go in, it didn’t work the same way for going out. My human had no idea I was doing this, so he heard me talk and couldn’t find me. I heard him asking “where are you, Bagheera?” He knew I was in the house because he heard me me talking, but he didn’t know where I was for a while. But he finally found me, opened the door, and I hopped right out. Silly human. Doesn’t he know that stress is bad for a diabetic cat and he needs to help me when I get into situations I can’t get out of? Sometimes I wonder why I keep him around. lol silly human…did you find anything interesting while you were in there tho? No, I relaxed a little. So it was okay, but when it was time to come out, I was ready to get out of there!